Trump-era Republicans learned from Bernie Sanders’ success. The Democratic National Committee still hasn’t. And that fact threatens to undo Dems’ potential gains. Halfway through Year One of the Trump presidency, the Democratic base is energized. Its voters are showing up at rallies, crowding town hall forums, self-organizing into local groups and scaring Republican incumbents: If Democrats turn out to vote in the 2018 midterms at the same levels they have in 2017’s special elections, the party will pick up 80 seats in the U.S. House. There’s one problem for the Democrats: The party has a serious fundraising crisis. As one of the people who led Senator Bernie Sanders’ fundraising operation during the 2016 primaries, I watched Donald Trump’s campaign take many of our ideas and duplicate them, employing language and tactics nearly identical to those we used on the Sanders campaign. What we found to be most powerful wasn’t just hiring the right people or using the right technology. What mattered more was figuring out an empowering message of hope and reaching people with it. In the Trump era, the Democratic Party has sputtered along with fundraising appeals focused on scare tactics—understandable, but counterproductive. Meanwhile, Trump—a billionaire who is already president—is still winning grass-roots donors by offering his supporters an empowering message. For years, Democrats were thought of as the standard-bearers of grass-roots fundraising, especially in the digital era. During the 2004 primaries, Howard Dean’s campaign pioneered presidential campaigns’ potential to both raise and rely on small-dollar online donations by focusing on a people-powered message and grass-roots campaign operation. In 2008, Barack Obama improved on that model, setting records for small contributions—which he broke and reset time and again throughout his presidency. Even as recently as the 2016 primaries, Bernie Sanders led all opponents in both major parties in small-dollar fundraising, outpacing any other primary candidate in history. Sanders’ supporters embraced the idea that the only path to success in the primary was if people came together to build the campaign themselves. Nearly 3 million people made more than 8 million contributions to the Sanders campaign because they correctly believed there were no millionaires, billionaires or super PACs behind the effort—nobody who would step in to save the campaign in a rough patch. We would sink or swim together, at an average contribution of (as you know if you ever heard Bernie speak) $27 apiece. Some of the Sanders campaign’s most effective fundraising emails were ones that highlighted specific small-dollar donors—like, for instance, a note from a small-dollar donor explaining why they contributed. It gave our supporters a sense that they mattered to us and reminded them that working people formed the backbone of our efforts. Trump did the same, once writing to supporters that “I want you to see this message I got from one of our strongest donors.” Trump included a quote from a woman named Vonnie who contributed $6, and said that “her $6 contribution was a BIG sacrifice.” You feel motivated, part of something bigger than yourself. Compare that approach to the one the DNC has taken in the Trump era. Most of the party’s recent emails to supporters focus on simply opposing the GOP health care bill, using subject lines like “Tell the GOP to back off!” and “Tell Senate Republicans to show us the bill.” Another significant portion of the party’s emails are about Trump’s Russia connections. “BREAKING: Donald Trump Jr.’s emails,” reads one DNC fundraising email. Another asks readers to “demand answers” about Trump’s connections to Russia—answers from no one in particular. There’s nothing wrong with talking about issues in emails—in fact, it can really motivate supporters. But without a positive context, the overall picture one gets from the DNC’s emails is of a directionless, reflexive party that fails to ask Democratic supporters to do more than oppose Republicans, let alone work for a different vision for the future of the country. Nowhere is this messaging problem more apparent than in the emails being sent out by the Democratic Congressional Campaign Committee, the party’s arm that focuses on races for the U.S. House. The DCCC has perfected a relentless digital program that seeks to squeeze every cent out of its email list. It even outraised the DNC online. But the DCCC’s email tactics can be described as dishonest at best and will almost certainly be unsustainable for the party’s long-term grass-roots fundraising base. You can set your watch to the worst of the DCCC’s fundraising tactics. In the early afternoon of the last day of every month, the committee sends a fundraising email to its list that screams “FINAL NOTICE” in its subject line and content. The effect is to shock people into opening the message out of fear that they've missed a payment or that they might have their power shut off. The effect of these tactics is to shock, depress or shame people into action. It’s the opposite of empowering. They use it because it works, at least initially—the DCCC is beating its own fundraising records, and Ossoff raised an unprecedented amount of money for a House race, with two-thirds coming from small-dollar donors. But while this strategy raises money in the short term, a party can’t build a future by telling supporters hour after hour that the sky is falling. It’s bad for the candidates, bad for the party, and, most vitally, bad for the voters whose support they need to build up. It’s also harmful to the Democratic Party’s allies. A 2014 experiment conducted between the DCCC and a left-leaning issue advocacy group sought to measure what effect the DCCC’s messaging would have on supporters of the advocacy group. What they found should deeply concern Democrats: Email addresses exposed to the DCCC’s program preformed 15 percent worse in both money raised and contributions made as compared to email addresses that weren’t on the DCCC’s list. Trump is even turning around emails from the DCCC back to his own fundraising list, “forwarding” the messages and highlighting the desperate language in them. A Trump campaign email sent early in July included images of recent Democratic fundraising email subject lines and contrasted them against his own. “We’ve created a positive movement focused on the American people,” Trump wrote. Seeing this kind of language from Trump and the Republicans, and the accompanying dominance in grass-roots fundraising, ought to make Democrats’ heads spin. It’s not too late for Democrats to reclaim the mantle of the party that is powered by small-dollar donations from working people. But it won’t be easy. Instead of tricking people into donating, it should give something people to believe in, and show how they can only win together. The Democratic Party needs ask supporters to invest not just money, but time and energy in the party and its campaigns. It should invite those supporters to help shape the alternatives the party offers. If the party can honestly and authentically change its message and actions, Democratic activists would embrace it with incredible enthusiasm. Grass-roots donors would jump to help tilt the balance of financial power and to shape the party's vision for future elections. Without such a change, the Democratic Party is going to keep losing to Donald Trump and the Republicans in the money race, big and small. It puts the party in a terrible financial position ahead of the 2018 midterms, and it sets up Trump’s campaign to have an unprecedented small-dollar fundraising operation for his reelection. 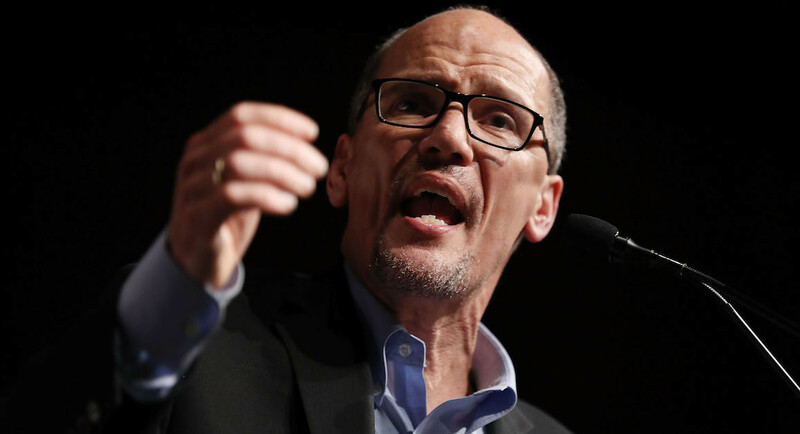 DNC Chair Tom Perez has acknowledged the party’s problem with small-dollar donors, saying during his candidacy to lead the DNC that the party needs to “go to school” to figure out how to raise money from grass-roots donors, like Senator Bernie Sanders did during his presidential campaign. He should enroll soon: Donald Trump and the Republicans are already several grades ahead.